ONELAB was founded in 2007 by Prof. Youngkyoo Kim who joined the Department of Chemical Engineering, Kyungpook National University. ONELAB dreams of creative organic devices based on new organic semiconducting materials and device structures, which can create future fields of science and technology. "Organic Electronics" provides exciting new research fields since it makes Organic Materials act positively as a key component in devices. As well understood in chemistry, organic materials can be designed and synthesized into various shapes in order to exhibit peculiar functions. This tremendous design freedom is expected to pave a bright way for organic electronics. Considering the recent speed of R&D on organic electronics, most of core electronic components could be switched to organic electronic devices from conventional inorganic devices. The first commercialized product of organic electronics is Organic Light-Emitting Device - OLED which is built as a display panel in smart phones and HD TVs. 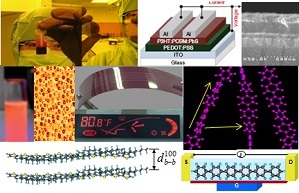 Besides OLED displays, we can experience record-breaking developments in Organic Solar Cells - OSC, Organic Field-Effect Transistors - OFET, Organic Memory Devices - OMD, Organic Detectors - OD, etc. Prof. D. D. C. Bradley - Oxford Univ. Prof. C. S. Ha - Pusan Nat'l Univ.